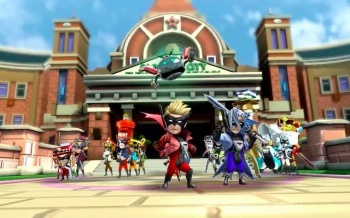 You should be very excited for Platinum Games' The Wonderful 101, and here's designer Hideki Kamiya to explain why. The Wonderful 101 is an upcoming Platinum Games title slated for exclusive release on Nintendo's Wii U console come September 15. It's described as a ... y'know, actually, I think I'll let designer Hideki Kamiya explain things. He was one of the main creative forces behind the awesome Bayonetta, and as designer for The Wonderful 101, Kamiya should have some pretty solid ideas of how his latest title plays out. "If I had to give a brief description of this game, I would say that it's a simple, pure Action Game in which you become a hero and defeat bad guys," Kamiya states. "It doesn't require a lot of deep thought. It's just that there's a few... well, a LOT... more heroes than in your average game." "The '101' in the title indicates the number of heroes. The reason we added one number to 100 is that we wanted everyone outside of the TV to become heroes as well. So what kind of actions can you pull off with this many heroes? That's the question we intend to answer in detail from here on out." Those words come from a new series of blog posts Kamiya is writing for the official Platinum Games website. Throughout the run up to the game's debut, Kamiya plans to explain various aspects of Wonderful 101, while also incidentally promoting Platinum's latest effort. See, Kamiya knows that since Platinum doesn't have the clout of an Activision or an EA, and because Wonderful 101 is a Wii U exclusive, it doesn't have inherent public awareness. "Most people seem to be going 'Oh, that's that game with the ridiculously large crowd of characters running around, right?' or 'Wait, is that the game where you play as a dog?' or 'Wonderful What? Never heard of it,'" Kamiya writes, before describing such reactions as "perfectly fine" and promising to explain everything over the course of the foreseeable future. While this first update is rather low on information - that explanation of what Wonderful 101 actually is serves as almost all of the useful text - we plan to keep an eye on the Platinum website for further entries. Kamiya designs the sorts of games that make people involuntarily scream giddy expletives at the on-screen action, so he's earned our attention.